Take the Christian Tour in Egypt and see the marvelous Coptic architecture. Visit the Monastery of St. Simon and St. Menas at Maryut, old Coptic Cairo, the Hanging Church, the Church of St. Barbara, Church of Abu Serga, Wadi Natroun & a lot of spirtual places. After breakfast, visit the famous churches at old Coptic Cairo to see Saint Virgin Mary's Coptic Orthodox Church also known as the Hanging Church, where the nave is suspended from the old Babylon fortress; admire the unique work of High and late Gothic architecture at Church of St. Barbara, which dates back to the 5th or 6th century AD. Proceeding to the 4th century Church of Abu Serga (St. Sergius & Bacchus), as well as the Jewish Synagogue and Coptic Museum with the largest collection of Egyptian Christian artifacts in the world. Back to hotel and overnight in Cairo. After breakfast, enjoy a unique excursion to the Coptic Monasteries in the desert at Wadi Natroun. Notable among them is the Baramus Monastery, which was built at the site where Macarius the Great settled in 340 AD and is still inhabited by monks. Back to hotel and overnight in Cairo. Trip to the Coptic Monastery of St. Antony and the Monastery of St. Paul, which lie at the foot of the Red Sea mountains in the Eastern Desert. St. Anthony was among the founders of Christian monasticism and St. Paul was one of the first hermits. The monasteries, founded in the 4th and 5th centuries, are both still occupied. Back to hotel and overnight in Cairo. 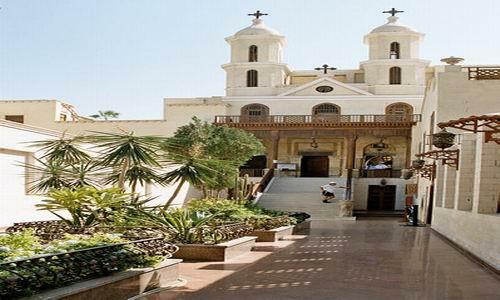 Visit the Church of the Holy Virgin with its three cupolas on the banks of the Nile at Maadi. Move on to the Monastery of St. Simon (Simeon) the Tanner, dramatically situated in the Mokattam mountain, on the outskirts of Cairo. St. Simon was a 10th century saint whose faith is said to have moved this mountain. Back to hotel and overnight in Cairo. After breakfast, trip to the recently built monastery of the celebrated martyr St. Menas at Maryut, near Alexandria. Built on the site of the 4th century shrine, which was the ‘Lourdes of the ancient world’, the site also comprises various excavated churches. Back to hotel and overnight in Cairo. After breakfast, enjoy an excursion to some of Cairo’s Coptic Churches: see the 10th century Church of the Holy Virgin in Haret El Roum, the Coptic Cathedral at Abbassia area. Back to hotel and overnight in Cairo. After breakfast you'll be transferred to Cairo International Airport for departure. Accommodation for 7 nights in Cairo including daily breakfast. All sightseeing tours are private tours. Free Mobile phone during your stay in Egypt (charged) about(30 min Local calls or 2 min. International Calls).